"This was something that I know I was ill prepared for but I'm glad I got my arse out to the states and took part." 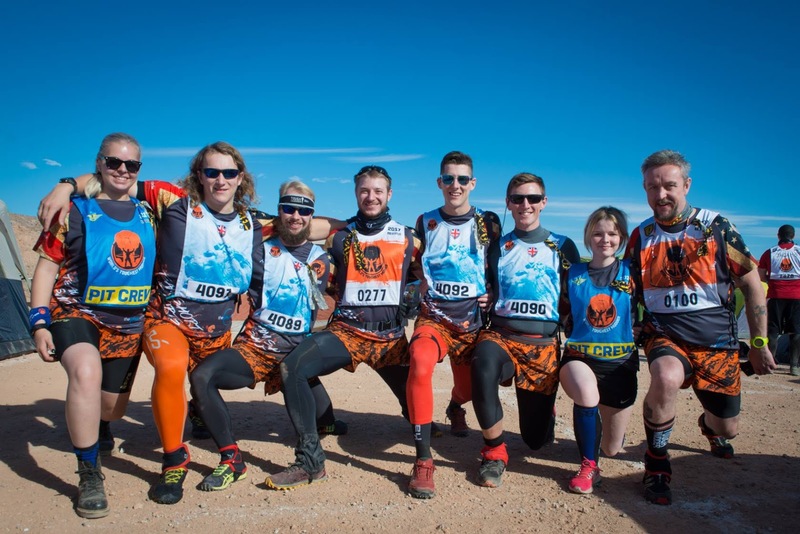 Having ran my first tough mudder in a cold November back in 2012, I've had a hankering to take part in what can only be described as the event to really see what you can push yourself through, the only issue being the costs involved with taking part, that stopped me. So late last year there was enough money that I was finally able to fulfil a mudder goal. Ollie had booked villa for the team, as a base which happened to be between the airport and lake Las Vegas and near to a Walmart, which made collecting supplies much easier than a hotel. After a couple of days getting supplies and checking in for our bibs, we had the tents set up and stocked in readiness for the event. Friday setup, checking out "The Cliff"
After getting across to the event site nice an early Saturday morning to unload the minibus, with the gear we would be wearing and eating. 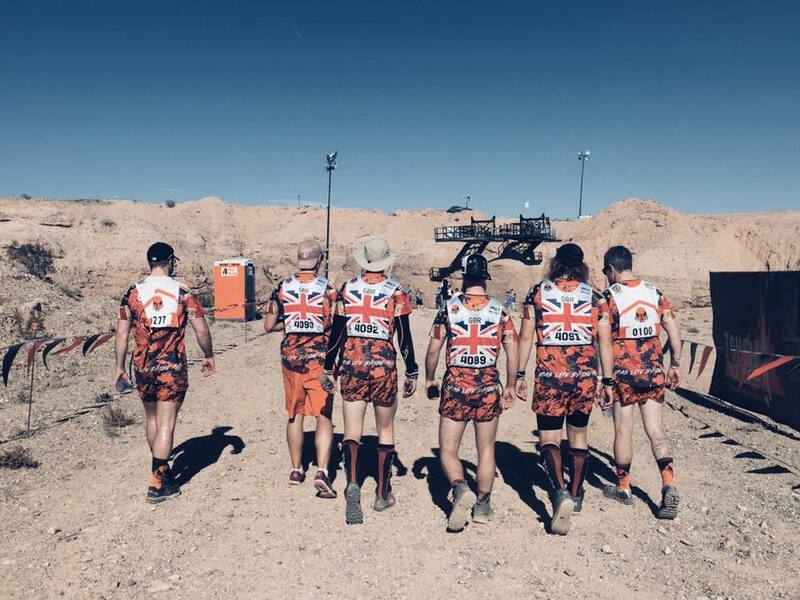 After hearing several pa messages about pit loading we were ushered to the start pen, where we were separated into elite contenders, team relay, contenders and then the open category. I sat with Tim and we listened to the safety messages and other information, Sean Corvelle did some shout outs to people he knew from US events, I spotted number 101 which I was pleased with. It was suddenly 12 pm and we were off, going up a pretty steep hill for the sprint lap, it was quite good bypassing all the obstacles seeing what to expect in the next 24 hours. It was an overcast day but it still felt really hot, I got to the point where a small water crossing was a relief regardless of how cold it felt. 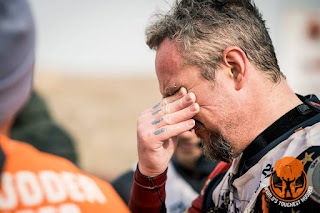 I got back to the pit in just over an hour which surprised me but I was really pleased, it might have been quicker but it seems I sweated through my socks and they were rubbing my toes and my heel, which meant I guessed that I probably needed some medical attention back at the pit. Once I got back to the pit area Anita and Nicola helped me sort out my feet, a quick refuel and then I headed back out again. 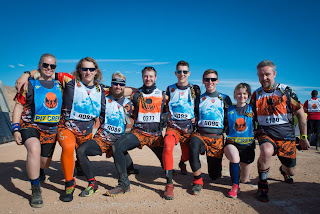 The second lap was much like the first, but a few obstacles had opened up, including kiss of mud, which reminded me of Electric Eel from Wales 2013, in that it was not so much muddy as it was a large collection of pointed rocks that jabbed almost everybody part. This was another great lap, a mere 50 seconds slower than the sprint lap. A quick bit to eat and back out, I was trying to beat some of the obstacles opening up, as I knew I would have issues with some of them and be forced into penalties. The desert it turns out was surprisingly hard to run on with the occasional bit of soft stuff, there were a lot of large rocks to avoid. My third lap was another quick one, it seemed my necked tailwind and some sweet snacks, was paying off as a strategy, my times for the laps were surprising a few people, myself most of all, with proper training I could actually become a better Mudder. I managed to get three laps in before getting into my frogskins, which was good as I probably would have overheated, if it had been any earlier. My timing was perfect, as the sun was setting as I came in off my 3rd lap. I bought the frogskins slightly larger than I would have picked normally, as it was suggested getting a size bigger and this wasn't a huge issue but I did find that I should have picked up a long sleeved base layer as I could feel the cold in my arms when I went back into the water, it wasn't a big issue but started to be something I noticed as the time went on. I kept moving forward and as obstacles opened my lap times got longer but not as long as I was expecting. I noticed that I had no major problems with obstacles that I could use my hands and feet on, it was any that I was hanging by my arms that caused me problems. I decided that as the night wore on, it would be a better strategy to take the bypass on things like Everest and funky monkey, as I reasoned it was better to save my energy and take a penalty than use up my strength, burn out and fail to make my goal of 50 miles. Though my laps got slower I still managed to keep moving forward and once the cliff opened, I opted to wait and take the penalty which I hadn't noticed was through water, oh well. The event continued much in this vein, with me taking penalties over the more physically demanding obstacles, that would have had me hanging in mid-air. The must complete obstacles were physically demanding but nothing that I couldn’t do on my own or with a little help. My strategic penalty taking paid off when I stayed ahead of Dan and Colin, who had done Everest then helped others and continued on, whilst I took the small run and water crossing. I kept running and walking getting the miles under my feet with reasonably good lap times, I did find that the hill out of the start had me feeling cold until I hit water, which I thought was just me, but Colin also mentioned feeling cold on that section of the course. I came in off my 7th lap I decided that I would do one last lap, so that I would be 10 miles off the 50 I wanted, rather than say 5 miles off, which would have upset me being so close, this meant an extended pit stop and change into my other wetsuit as I was getting cold, it seems my neoprene socks work well if I'm in water frequently but not so well sitting still. I went out for a last lap and Tim stayed with me the whole time, I think the combination of amount of time I had been going and the wetsuit being so thick meant I was fatigued going round and having to take regular breaks, I managed to complete all the must complete obstacles but I was getting more tired with each mile, I had myself telling my sub conscious that I would be completing the cliff, as I've wanted to do it, for the last few years but when I got up to it, I was broken, I sat and cried before taking the penalty option and sobbing my eyes out, feeling utterly broken by the course and the event. Looking back as I write this, I’m not disappointed that I didn’t get to the 50 miles I was hoping for, as I’d made the decision to stop when I did, I do think that I should have kept a closer eye on the time that I spent in the pit as that was around 6 hours. So I'm not sure what has brought about a change in my mental health, I've an idea that it could be eating a healthier diet, with fewer takeaways, though not takeaway free and starting to train for World's Toughest Mudder which as of starting to write this post, a mere 64 days away. The main thing is that I'm feeling a lot better in my brain, I've known this entire year that I needed to get out and train as my fitness has declined over the last couple of years but I've always had no motivation to get out there and build my fitness back up to the point where I was continually running when I wasn't doing obstacles, don't get me wrong, I've loved taking part in all the events I've done this year, from travelling to the US to the smaller events I've ran in, I just haven't been fit enough to get the times I could do, also having gained a bunch of weight back has made getting over obstacles more challenging, although I have managed to beat Kong (the rings suspended over the crash pads, for any non Mudder readers) several times and the current version of Funkey Monkey, though I did come close in Scotland to beating it, just not enough momentum to get off the last ring. So as I sit on the bus and spot someone out running, thinking I wish I was out running, I think I can say that since getting the news before the first year of my degree that I wasn't getting course fees paid which is what seems to have caused my depression to kick up, I'm getting back to a mentally healthier and a physically healthier me, which I'll bloody take and hope I can avoid falling into another slump any time soon. So after a great run on Saturday, where I pushed myself through everything and only avoided pitfall and Everest so that I would keep my hands dry for kong, which ironically I slipped off the third ring as my hands were too dry and dusty from the mud but I said to myself no I'm going for this, i wet my hands to get a bit of grip and made it across, even going back and having a play when I'd finished, making it across twice and then two and a half times, l had high hopes for Sunday being a good day. We arrived on site and I quickly got into my outfit for the run complete with bow. A quick hello to Owen and Laura then across to the main village for our bibs and face marking. A quick greeting to other familiar faces and into the warmup pen, I got to be on stage warming up the crowd, though the warm up woman thought I was Aunt Sally from Worzel Gummidge rather than Dorothy from the wizard of Oz. 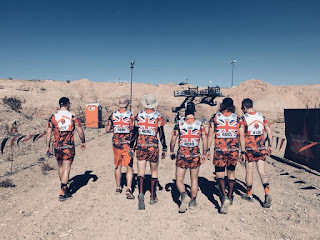 As it was a milestone event, Gil did a fabulous start area warm up, with me in the centre, then I got to do the countdown and high five / hug the mudders setting off, which was cool. I caught up to the back of the wave and plodded on, running and walking, lots of people liked the outfit, which was nice. Once I hit the mud, I knew it would be much harder wearing the dress. When we got up to mud mile part of it was closed, as someone had gotten stuck the day before. We met up with Thomas and Jake at hero walls. The course wound around the grounds of Loughcrew really well, with the half event being incorporated in the full course in the best way I've seen as yet, if there was any criticism it would be having a single lane for cage crawl as that meant there were some larger queues waiting for people to get through. Thankfully the weather stayed really nice for both days and the threatened rain never turned up. I was trying to emulate Owen walking the block for blackness without falling in the water but I managed it once before ending up in the water, i dont quite remember wgat happened as I went in the water for the second block but I smashed both shins against the edge and a surge of adrenaline raced round my body and I felt incredibly cold even though I knew the water wasn't cold, it took a little while for it to wear off but I knew I wasn't cutting the course or quitting, as I wanted to finish my 50th event properly, so we continued on (as a sidenote, I dont recommend this, as there is little muscle in the shin area so my leg has swelled and is painful to walk, stand or have in a vertical position). I went through pitfall but kept my hands away from the mud and I looked at Everest and I immediately said nope, not a chance, it was dangerously slick looking and knowing my luck, I'd have injured myself. I climbed up to the rings of kong and got to the third ring which was covered in mud but after picking myself up, went round and got across, then Gil had me going through electro shock therapy, I noticed the wind blowing the wires so I went down the side of it avoiding the wires so avoided being shocked, before being crowned with the black and gold headband by Gil and crossing the finish line under the arms of an archway of mudder and volunteers, which was great fun, so I'm the 6th person to reach 50 events, which has taken 4 years, 7 months, 22 days since my first one back in November 2012, with every year increasing the amount of events I'm going to take part in, this will have been the busiest year, with a bewildering 22 events. So as a proud holder of a black and gold headband, I'm curious as to when the next colours will be coming out an what they will look like, I'm hoping they are a combo of silver black and gold black but reversed, so that silver/gold is backed with black. Though well see if enough people start reaching 50 events but with the numbers already past 25 it won't be too long till a lot have passed the 50+ mark. So after I had finished my first year at college I wanted to work on an app that would combine my enjoyment of building Android applications and my love of Nes games, I had started collecting them and had no way of remembering which ones I had, which meant I picked up an extra copy of rad gravity pal version. So I started to design and build my Nes collection app, this originally started as a way to catalogue European games but as I owned a couple of US games, I thought this would make sense to include the entire official and unofficial list for games released for the system, I included unofficial titles but left out the pornographic titles as they were so incredibly rare that there is little chance of the average person actually getting their hands on them, I also included one entry per game regardless if it had a different title in the US or Europe. I started out with a handful of games and the cover images, just to ensure that I could actually get the images to display as I'd wanted to do this years ago but couldn't find a solution but also didn't really try to find one, I tried a wide range of methods until I discovered that questioning the R.java file where each asset and onscreen button, text box etc. are listed would give you the id for each image file, it was then just a simple task of setting the image to the image view and it would show on screen. With this problem solved I was able to proceed with the building of the app, I realised once the basic functionality was in place that this would be a mammoth undertaking as I had discovered that there were 800+ games released for the Nes and that each would need an image, synopsis and details of who published it and the year it was published, plus the genre and sub-genre that it belonged in. As I was putting the basic features into the app, I kept coming up with a new list to show the games to the user and then when that was created, I would come up with a feature that I thought would improve the app for myself and other users. One of the hardest issues to deal with were the bugs that would occur due to the way that I had put the database together and because I've not used a database helper class, I needed to tweak and change the way that I put the sql string for querying the database together. Once I had a fully working version, I decided to release it as a beta version, so that I could get some feedback on crashes and how the app worked for the users, I got some useful feedback that helped me to fix issues that I hadn't discovered when testing, I also got a lot of people asking how they could play the games, which meant that I had to change the name of the app slightly and add "this is not an emulator" in the short description and full description on the play store app page, I did receive fewer bits of feedback asking about how to play the games after that. One of the biggest annoyances is that Samsung has released some devices with really high resolution screens, so I kept getting crash reports when users were trying to view the list of games, I can only put this down to the images being resized and the device running out of memory, which was a pain and meant I had to try and find some much larger images to use thankfully I was able to and although the app is now a bigger download, the images look quite nice on smaller resolution devices, which is a nice bonus and hopefully I shouldn't get anymore crash reports from those devices. The one thing I've enjoyed has been finding ways to solve problems that I've had and I think it has helped me grow as a developer, I need to start working on other ideas that I have, plus I think people want other apps that catalogue other Nintendo and Sega consoles, which I want to do but the amount of work involved collating the information and cover images is going to take some time. What a weekend, the weather was scorching hot, the course was undulating and hilly in places, the friends were many and the event was really good, with a couple of exceptions, one of my favourites so far. As the event isn't too far from mine it didn't take too long to there, even having to stop off to ensure we didn't get there too early. We'd entered the tougher wave, which is the first wave to set off on the Saturday morning, with prizes for the top three finishers. I have no chance to win but you do get a different headband and t-shirt which is always nice to have. We set off and maintained a steady pace with me thinking as I always do that I should have trained on hills to make it easier, I should really have trained full stop but that's a whole different thing. Mud mile was deceptive, as it was really dry until you hit the mud, so after rolling through which is easier than crawling, I was covered in mud, which was really heavy and meant that running was harder, it meant that my energy was being drained, so climbing skidmarked was really difficult. It was starting to get really warm so artic was a nice refreshing dip, pyramid scheme still had the ropes on it to get up, which was helpful. the rest of the course was well laid out, with enough hills to make it challenging, they had penalties if you couldn't get across funky money which I didn't but as time was getting on there was no penalty to do. I ended up using the rope at everest which was hard but I;m still wary of that since last year at the Midlands. We collected our legionnaire headbands and only kong left to tackle, When I got up there the young lass volunteering said "you've got this" with my brain thinking I probably don't, as I felt tired but as I reached the forth ring, I thought perhaps I do have, reaching the fifth and getting to the other side had me feeling really ecstatic, so much so that I was telling anyone I knew that I had managed to get over. Off for volunteering which was tiring given how hot the day was, thankfully I didn't burn too much but I did feel sick and tired and had to take shade from the sun. We didn't get out as early on the Sunday but we had decided to take part in the help 100 mudders over an obstacle, so we headed out between waves, to get up to skidmarked, I of course didn't get myself over before helping 100 people get over it, which meant that I had no energy to get myself over like I usually do, still I discovered helping 100 people of various shapes and sizes was really hard, if people pulled themselves up and over that helped more than if they were shorter and lighter, I think looking back I might so that again but work on lifting weight, like a sandbag repeatedly, might help with this. Got pulled down off pyramid scheme again but noticed someone running up the side, which was quite dry so we used that to get over. we helped a few more people over and through things, I almost made it across funkey monkey, only just missing the last bar to get me on to the other side, which I was pleased at managing to almost get over, we kept plodding on and then helped a whole bunch of people at blockness monster which is my current favourite obstacle, I didn't manage kong and looking back I should have given it another go but there is always next time. I thoroughly brilliant weekend aside from the burning temperature, midges and some obnoxious people being loud late into the night.